STYLE: For applications that only have room for a stock oil pan but require better oil control and horsepower savings. SIZE: Stock depth, 5 quart system capacity. FEATURES: Trap door baffle, scraper and windage tray work to direct oil to the pickup. #15-010 for pre-80 blocks with left side dipstick. #15-010M pan for 80 to 85 blocks with right side dipstick. #20-010 with SM. BL. S.V. Pumps. #20-013 with SM. BL. S.V. Pump, 3/4" tube #M155. 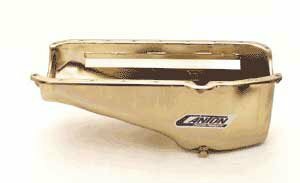 SIZE: Shallow 5-1/4" deep, 11" long, 8-1/2" wide sump, for a 6-1/2 qt capacity. STARTER: Works with stock starter. STYLE: Designed for 84-96 Corvettes, is 7" deep so it fits well in a variety of chassis were low ground clearance is an issue. These pans are also being used in Corvette Drag Race Cars with great success. FEATURES: 5 Trap door baffles, removable one way screen windage tray with built in crank scraper, oil temp fitting, magnetic drain plug, 20mm fitting for low oil warning sender. 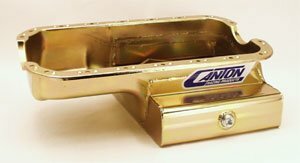 SIZE: 7" Deep, 13-3/4" wide, 12" long sump holds 6 quarts which gives a 7 quart system capacity. #15-240 for pre-80 blocks with left side dipstick. #15-240M for 80 to 85 blocks with right side dipstick. #15-240T for 86 and newer blocks with one piece seal. #20-044 Pickup for SM. BL. S.V. Pumps. #20-049 Pickup for SM. BL. S.V. M155 3/4" dia. #20-074 Pickup for SM. BL. H.V. Pumps. #20-079 3/4" Pickup for Melling #M155HV. 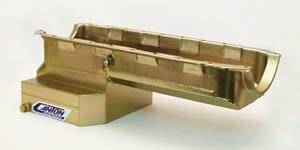 STYLE:“ T ” Style sump for increased oil capacity, while retaining stock depth. Angled front corners of sump to fit early Camaros and Novas. FEATURES: Slosh Baffle, magnetic drain plug. 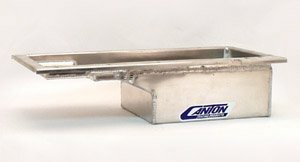 SIZE: 8" Deep, 12" Wide, 9-1/2" Long sump gives a 7 quart system capacity. #15-320 pan for Mark IV Big Bl. Chevy. #15-320T pan for Mark V and VI Big Bl. Chevy. #20-170 for Big BL. pumps. 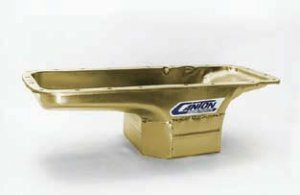 STYLE: Deep mid-sump oil pan designed to fit B/RB and 426 HEMI engines in most production chassis. SIZE: 7" Deep by 8-3/4" Long for a 7 quart system capacity. FEATURES: Horizontal slosh baffle for oil control and magnetic drain plug. 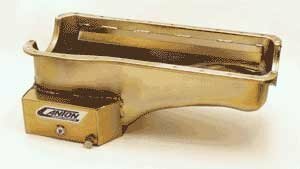 STYLE:Steel T-sump oil pan for use in competitive Drag Racing and Road Racing applications. SIZE: Stock depth, 12 1/2" wide and 8 1/2" long, pan has a 5 quart capacity. FEATURES: Diamond shape 4 Trap door baffle assembly, 3 runners, magnetic drain plug, 1/2" N.P.T. fitting. ENGINES: For D16A with most aftermarket and stock exhausts. #15-961 late D16A stock replacement pick up. STYLE: Shallow “ T ” sump style pan fully baffled for Road Race conditions. FEATURES: Track proven diamond shape road race baffle assembly with four trap doors and runners to direct oil to the pickup under all conditions, bolt in windage tray, temperature fitting, magnetic drain plug and crank scraper. SIZE: 8-1/2" Deep, 12" Wide sump gives an 7 quart system capacity. #15-763 pickup for recommended pump #M84DHV. 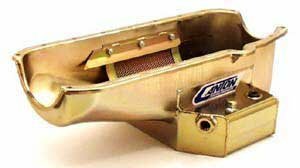 STYLE: Deep rear sump pan for increased oil capacity and oil control in 79 and up Mustang's and 80 & up T-Bird chassis. FEATURES: #15-620 and #15-670 feature a Slosh baffle, magnetic drain plug, crank scraper, provision for pan mounted dipstick. Works with long tube headers. #15-620S is the same as our #15-620 except comes without the crankscraper and is deeper in the center for main support clearance. #15-670S is the same as our #15-670 except comes without the crankscraper and is deeper in the center for main support clearance. SIZE: 9" Deep sump gives a 7 quart system capacity. #15-620S for 289-302 blocks with supports. #15-670 for 351 Windsor blocks. #15-670s for 351 Windsor blocks with Girdle. #15-621 3/4" Dia.p/u for 15-620 & 15-620S. #15-623 7/8" Dia p/u for 15-620 & 15-620S. #15-671 3/4" Dia. p/u for 15-670. #15-673 7/8" Dia. p/u for 15-670. #15-675 3/4" Dia p/u for other steel supports for 15-670. #15-677 3/4" Dia p/u for CANTON #21-062 support for 15-670.